There is a beautiful Editorial Calendar that helps you to give a clear picture of all your planned and published content. The content is created just by clicking on the date and filling the information required, you can also Drag’n drop your content to a new publication date. When you click on the date where you create a task to the post you’ll be able to take a look at its description. 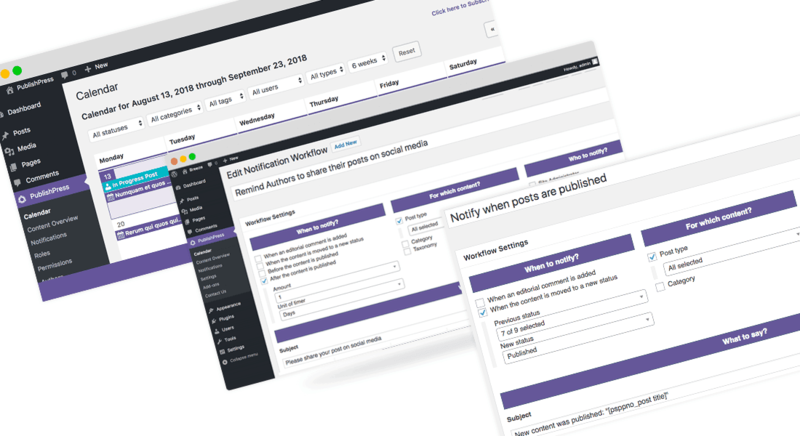 With PublishPress you can create a notification for your team to keep them up to date with all that happens in your blog, you’ll be able to customize your notifications with some options. You can also create a description for each notification. You can leave comments to your writers about the post with a private chat based on comments, this is a conversation that can only be seen by editors and writers so that all your articles are exactly as you want them to be. It is really easy, just comment the article in the post writing area at the “Editorial Comments” section, the writer will be able to reply to your comment just by clicking on Reply. Another advantage of this tool is that you can notify all the user/Role you want just by selecting them in the right section. This tool helps you to have all your team aware of how the article/page is going, you can put it as status "assigned", "Pending", "In Revision" and you can add all the states you want to make it easier to communicate between the team. You have a lot of option to create your own statuses. Not only do you have the option to see all your tasks organized in the calendar, you can also see them sorted by statuses, in this way it will be easier to detect which are the items that need more attention, which have not been started, which are completed and thus be able to manage your workload in a simpler way. This tool allows all your team to have a much more detailed information of each content so that they can work with more accuracy and to carry the workload in the best way possible, you can describe important attributes for the correct creation of your content. Many people benefit from everything that PublishPress offers, especially large content producers. This plugin has really changed the way to create content and manage all your workload in wordpress, has a friendly interface, has many tools that help improve the quality of your posts, and also has a really attentive support. The reviews where everyone talks about how this plugin has facilitated wordpress management, how it has helped them manage their team and how it helps them never to leave an unpublished post.